An endangered Indian wolf was spotted in a lake area in Nagpur by a group of amateur nature photographers after it had gotten its head stuck inside a plastic container, while supposedly looking for food and becoming malnourished over time. Tanay Panpalia, a chartered accountant and wildlife enthusiast from Nagpur was exploring the jungles of Umred, a wildlife sanctuary, about 58 kms from Nagpur, with his friends. While they were clicking photographs of the beautiful birds that live nearby and were on a lookout for any mammals nearby, they noticed a pack of wolves and decided to go closer in order to get a better look at them, as spotting wolves or wild dogs is a rare sight in Umred. 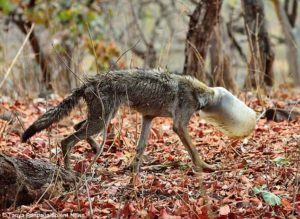 They decided to chase them from a safe distance when Tanay spotted one wolf from the pack whose head was stuck in a plastic jar, which was something unusual. Perhaps he was living with that container in his head because he looked malnourished and there was a chance that the animal would die out of starvation. Tanay, a member of the Tadoba-Andhari Tiger Reserve (TATR) and his friends immediately informed a rescue team from the Forest Department of Nagpur and followed the wolf until their arrival. He believes that the container probably belonged to someone from the nearby villages because it was a typical container that Indians use to store food grains. They disposed it without caution after the container was seen as unfit to use. It is believed that the wolf might have been searching for food by trying to sniff it when the incident took place. The rescue team took about two hours to reach the stop where the wolf was. Meanwhile, Tanay and his friends had their eye on the animal. With the help of a rescue kit, the team caught the wolf and cut the container carefully. Even though the wolf is reunited with his pack and will slowly become healthy, it is an alarming lesson for the humans on being careful about what we let out in nature and take charge in critical situations.